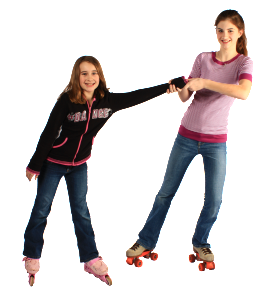 In addition to the Saturday Learn-2-Sk8 Classes, we encourage enrolling your child in Skating School. 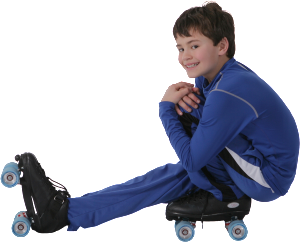 The basic fundamentals of the sport of roller skating are taught and enhanced. Advanced skating and conditioning skills are also offered, improving self-discipline, teamwork, concentration, and coordination. We then use the basics to create art in the form of a public performance, each Winter, and Spring. Choose from Dance, Advanced Dance, Drill, Singles, Tiny Tot and traveling Precision Teams. DEVELOP Balance · Coordination · Discipline · Teamwork. Tiny Tot Tiny Tot class is for children 6 and under, emphasizing both safety and basic skills. Drill Group uses a combination of formations of the group to create images of art for the final performance. Dance Group utilizes the art of rhythmic movement on roller skates to create unique and varied performances. Singles Group uses the art of jumping and spinning combined with the skills learned in dance and drill to create an extreme performance. To participate in Singles Group you must participate in either the Dance and/or Drill Group. Skills & Drills offers beginner to advanced skaters the opportunity to improve and increase their roller skating skills. This class is a great secondary class, or for those who do not wish to participate in the bi-annual performances. PERFORMANCES Each class (except Skills & Drills) will have at least one choreographed group number, performed in conjunction with solo and guest performances. For those interested, solos and duets are available, requiring private instruction for choreography.